Unless you’ve been living in a millennial co-working youth commune, it isn’t news that old people rule the universe. For prime examples, consider the 100-year-old grandmother who owns at beer pong, or the woman who demanded strapping firemen present her with cake on her 105th birthday. The youth and vigor of those old ladies might pale in comparison to 95-year-old Bettie Bulter, who jumps out of airplanes like a damn Navy SEAL. 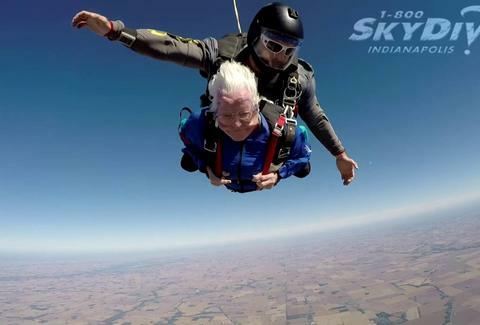 Butler went skydiving for her 95th birthday, proving that age is a deterrent for nothing. Younger skydivers look hesitant staring at the miles of earth stretching beneath them. Meanwhile, Butler is completely jazzed as the wind rips through her hair. She can’t wait to get off the airplane and become one of the only grandmothers to achieve human flight -- a feat she tackles with aplomb. Happy birthday Bettie Butler. Maybe next year you can celebrate by getting arrested.